Turkey’s Economy Minister Nihat Zeybekçi on Saturday likened pro-Kurdish Peoples’ Democratic Party (HDP) deputies who were arrested last week to rats coming out of a sewer. “We will not go. Come and get us, says one [HDP Co-chair Selahattin Demirtaş]. The state of the Republic of Turkey took them by the neck like rats coming out of a sewer and brought them to court,” said Zeybekçi in a speech to a crowd in Denizli. Turkish courts on Nov. 4 arrested nine HDP deputies including the party’s co-chairs, who were detained in the early hours of the same day following police raids on their homes. HDP Co-chairs Selahattin Demirtaş and Figen Yüksekdağ and deputies İdris Baluken, Leyla Birlik, Nursel Aydoğan, Selma Irmak, Ferhat Encü and Gülser Yıldırım were arrested on the afternoon of Nov. 4. Counterterrorism police in the early hours of Nov. 4 raided HDP headquarters in Ankara and conducted a search of the premises, while 12 deputies, including the co-chairs, were detained in police operations in Ankara and the southeastern provinces. The operation was launched after the HDP deputies refused to testify about alleged crimes linked to “terrorist propaganda. 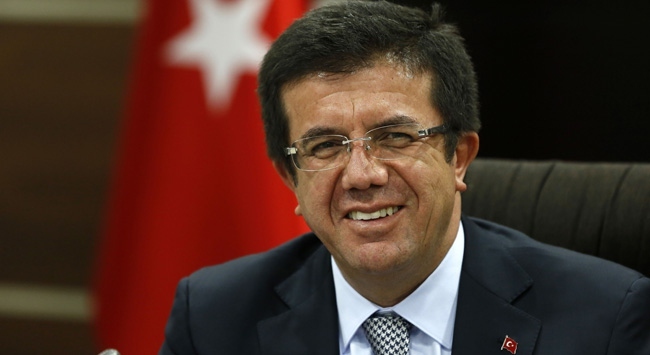 Economy Minister Zeybekçi drew reactions in August over his remarks on how the government will punish plotters of a July 15 failed military coup. “We will put them into such holes [jails] for punishment that they won’t even be able to see the sun of God as long as they breathe. They will not see the light of day. They will not hear a human voice. They will beg for death, saying, ‘Just kill us.,” said Zeybekçi in speeches to anti-coup protestors in the western provinces of Denizli and Uşak.